Huh! I assumed it would be on the CW. Nah, CBS is going all in to build their own private Hulu, and this show is going to be anchor for it. Ugh I could not even watch that trailer - I guess I am too old. Capt. Mads Mikkelsen or bust. I've thought for a while that taking the "Far Beyond the Stars" conceit as real would've been amazing, though not exactly sustainable on a series-wide basis (i.e. 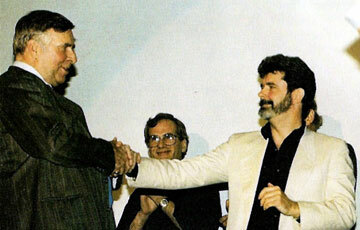 that would've been a much better DS9 finale than what we got). Hmm, well Paramount will probably sell the Trek to Disney once they are finally able to admit to themselves the glaringly-obvious fact that they're embarrassed to own the property, and I'm pretty sure ALF is a Muppet, so I think this has legs. you dont think wb would buy trek to keep the wb/disney battle going on a new front? Interesting proposal, I look forward to the WB Trek movie where Spock drives an axe through Kirk's spinal column for no particular good reason other than that it's totally dark + extreme to the max. Oh great another Kurtzman-Goldsman joint. Because they did such a great job with Fringe. this is weird to me. why would fuller walk away from this because he 'doesn't have time'? clearly something must have been going wrong. I hear he wants to spend more time with his family. season 3 of fringe was pretty good. then kurtzman & orci demanded a dumb cliffhanger and the show never recovered. Trek has always had a mix of inspired weirdos and hacks, I feel like it benefits from that. Fuller's working on at least two other tv series, including American Gods. If the Paramount people kept meddling and were an irritating presence, it'd be a good reason to bail. Sonequa Martin-Green will play the lead (the XO of Discovery). Should we change this thread title? I'm not going to believe this show is happening until there's an actual pilot date. It's funny how much she looks like a younger Angela Bassett who had been tipped to be in the series. wasn't there a rumor they were doing an anthology series with a different timeframe/cast each season? hmm. lol I watched the original Mudd ep the other night w my daughter and the entire time I was distracted by the highly visible shaving line all around Carmel's neck. I guess I hadn't been paying attention but, uh, you have to pay for some CBS streaming service to watch this beyond the first episode? Really? I hope everyone enjoys the first ST series to last exactly one season. This should be worth a flyer just for more Michelle Yeoh. I'm sorry, I misunderstood: CBS is only airing the first half of the two hour pilot on actual TV. Fun idea. anyway when the streaming service fails they'll probably just toss it to another streaming service. doesn't necessarily doom the show. Skipping 625 messages at this point... Click here if you want to load them all. It is still possible that Michael becomes the red angel. Her mom/Kima Greggs didn't know about the signals, and there's still a suit lying around. tru dat. i stand by the furious handwaving comment though. actually no, i just watched it again and the suit gets pulled back... to the future! before her mum does too. You're right. I thought Section 31 had another suit, but I was misremembering the episode before last. they'll probably find a spare in a cupboard somewhere. Was the eye needle machine explained? If Control = Borg is real, then the eye needle thing could be referencing the beginning of First Contact, where Picard's nightmare within a nightmare includes some closeup eye surgery. Yeah borg use needles/piercing all the time to insert nanoprobes, I'm wondering why I never saw the possible connection to start with. Ageed I think suit may come back with someone else in it (ie Michael). Otherwise doc's afterthough "oh well with mothers and daughters its REALLY almost a match so you know" was a bit weaksauce! Ugh, yeah, that was nonsensical, especially since a few episodes ago they said that it was a 100% match. I dunno, i’m enjoying this season and it seems mostly full-assed to me. I didn’t notice any specific plot holes or weird bits this week. I binged this season up to episode 7 over the weekend and I hit burn out - roughly similar to how I hit burnout somewhere in the middle of Matt Smith-era Doctor Who. I've been liking them, but the drama and curse of the puzzle box plot gives everything an overall sameness. I'm not too emotionally invested, but maybe I can just skip ahead - then I never do and just check this thread to see if anything happens. I thought what made the least sense what Pippa going along with Leland's plan when he was clearly a different person and advocating a course of action (hijacking the data) that was extremely suspicious. I was hoping she'd be a little savvier but she actually went along with it up until Michael's mom happened to say something that sounded a lot like what Leland had said and that tipped her off. Otherwise most of these discrepancies didn't bother me v much. this last one was a nothing episode. pretty clear that they're remaking terminator 2 now. I am guessing lizard-faced Linus and JETT RENO were last minute additions to the show as they have yet to add anything to the story. Unless I missed something, one thing that didn't make sense this episode is that they need the time crystal in order to change the future but if Pike takes it he's unable to change his future. I assume that the time crystal fantasy elements in this episode will be ignored in future episodes. I actually enjoyed this episode! It's relatively light on plot but I think that's a good thing, because, first, it gives more space to for the episode to work on character development (the Spock/Burny back and forth in the shuttle bay was cute, Reno trying to fix Stamets/Culber), and second, the characters make a lot fewer stupid plot-driven decisions that have been annoying me. I also really liked Pike's pep talk to himself, the most/best Trek thing the show has done in a while IMO. I agree that the character bits in this episode was nice, but the whole Time Crystal thing with the mystical test of a character etc. was just too much Doctor Who style science fantasy. It may work in Who, but Trek is still supposed to be sci-fi with some grounding in the reality, so magical minerals with an apparent mind of their own felt way out of place. Also, for this supposedly super-advanced AI, Control was far too eager to give Burnham and Spock a proper Bond villain monologue, explaining its internations and giving them time to defeat it. If it only intended to kill and assimilate Burnham, why didn't it do so back when they were on the Discovery shuttle, were both of them were within striking distance and unarmed? also how would it have crossed the room in 0.8 seconds and broken all the metacarpal bones in burnham's hand when it had no such special powers in leland's body? also does ethan peck sculpt his beard to look more vulcan or does it just grow like that? Thought that was a decent setup episode. Burnham is just a lot more interesting when she has Spock to play off. Trek has always been full of mystical magic nonsense, imo. Failing at basic Dr Who level time travel here. The signals can still be the red angel, who could have made them in your future, her past, Pike. Pike's assumption is based on Dr. Burnham saying she wasn't responsible for the signals, and the timesuit seemingly being lost, which would mean she can't do them in her future, his past either. Of course we know that someone, either Dr. Burnham or Michael or someone else, will probably locate the suit against all odds and create the signals. But you can blame a character making assumptions based on real-life probabilities instead of the logic of fiction. so is the sphere data -- and by extension, discovery -- sentient now? i mean if it can prevent self-destruct and raise shields and everything . . . I hope the season ends well, as this show is legit fun and good right now, playing into the "it's like TNG, it just needed to warm up" narrative. Perhaps they'll reassert the status quo, but would be interesting to see the show move into the post-DS9 era. My current theory - Control really is a borg origin story. And somehow, they will prevent it from obtaining the sphere , but in retaliation Control decides going aorund assimilating all places/knowledge by brute force is the next best way to achieve perfection, if they cant get it from the sphere. That last epsisode had WAY too much red-herring goodbyes and crying and Sombre Gazes and then no ones leaving anyway arrrrgh get on with it. I didn’t mind all the sombre goodbyes this time, as opposed to the Saru dying-not-dying episode, which went on forever. Writing seemed better too this time, maybe? the borg origin story angle seems a little too on the nose, but maybe! I didn't expect the show to move towards the "Calpyso" storyline, at least not so quickly. I am just catching up with episodes now. I got so excited at the start of the Talosian one because I thought it was going to be some cool mashup thing, but it was not good at all. I think every new Star Trek iteration tries to recreate the magic of the Wrath of Khan by revisiting old enemies and scenarios, and that's just not an easy thing to do. But the Control episode after it was superb. Funny that Tuomas mentions Doctor Who upthread. I thought it had a real Who vibe about it, but without the messianic histrionics. I am also warming to Spockolas. Jokes help. People Turing up on discovery like they popped round from next door whilst it’s taking 57 more minute for the baddies to turn up is getting really old. That last episode was pretty good! Little confusing in places (if control got subdued by Philipa with the magnet whyd they even need to do what they did?) but yeah lots of action and tension. Yeah, that was some v good Trek there! Plot holes aplenty around death of Control but that aside, yes. I wonder how it is going down with the Trekkers. have we had fighters/drones like that before in trek? also, why did the signals appear briefly at the start of the season? why did burnham bother with saru's backwards shithole planet instead of getting someone like the vulcans to help out? yes, i could deal with a few of these, but all together they come across as sloppy writing. "have we had fighters/drones like that before in trek?" Also it’s seems like poor starfleet management practice not to nominate a captain from the legions of commanders on discovery before they disappeared into the future. I did like Number 1s very 60s hairstyle and overall looks. The 23rd century is about to enter a very retro phase. Spock used contractions! He might be Vulcan, but he's no Soong-type android. I really liked this for its pure spectacle! There's a million things that don't make sense this season (yes, the current writing regime continues the proud Trek tradition of not being able to do cool, well-considered sci-fi concepts*), but they hit enough beats that made up for it: Burnham's flight in the suit; the SFX for all of her jumps; Lrell and Ash with the requisite "TODAY IS A GOOD DAY TO DIE" (I seriously got choked up when they said it). * Like they literally didn't need Burnham to send an additional signal! She appeared to Spock as a child, which should've been proof enough that she made it through the wormhole. I'm pretty sure we saw some in some of the big space battles in DS9.